November 2017 Disney World Park Hours and Crowd Calendar now available! 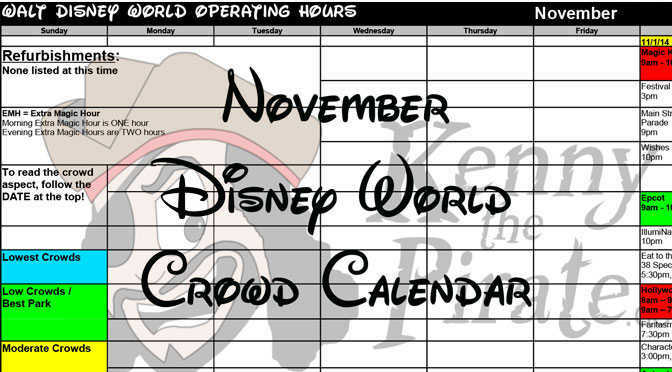 If you’ve been waiting on my November 2017 Disney World Crowd Calendar, it’s now ready for you! The Crowd Calendar for November 2017 is now ready for those of you planning to visit Walt Disney World. It includes initial park hours, Extra Magic Hours and schedules for parades and fireworks. The park hours will update several times throughout the next few months and more showtimes will be added for things like Fantasmic!, Star Wars Fireworks and Rivers of Light. This initial November 2017 Disney World Crowd Calendar will help you choose the best park to visit each day as you create your initial plan and book your dining. I would expect the Thanksgiving week to become drastically different as the Magic Kingdom usually opens at 8am each day. Animal Kingdom will be extended as well. Why are they closing at 4:30 on Thursday?!?! Is there a reason they close so early? November 30, 2017 shows MK closing at 4:30pm … is this correct? I just looked on the dates you published and not seeing the 10th of November. Was really hoping for one since I’m only in Orlando post cruise for 1 night. If you had to pick Christmas party on November 10 or MK during the day from a crowd perspective which would you pick? Nov 10th has MK closing at 7 but there isn’t a party that night. When will park hours and crowd calendar update? There is a party. Look down under the show schedules and you’ll find it.